To view larger images click on the image you wish to see larger. The circuit I used to build this microphone was taken from a recent article in QST with one modification: The uBITX mic element, is an electret mic element, not a dynamic element and it needs a biasing voltage to drive the mic element. 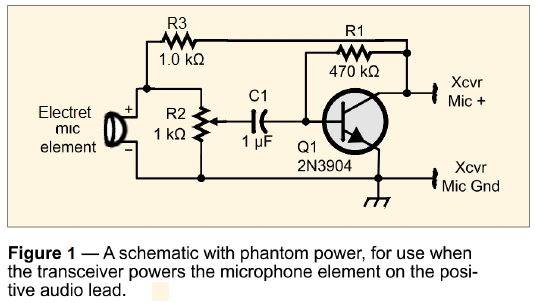 I looked up other electret mic elements and how to bias them and found that in the past I'd used some from Radio Shack. Those needed a 1K-Ohm biasing resistor, so a 1 K-Ohm resistor was added. You will also notice that I used a longer 1K-Ohm variable resistor for the transistor amplifier. There were two reasons for this: (1) this resistor is more accurate than a smaller pot would be, and (2) I have more of them than the smaller ones. I figured that if it didn't fit into the case I intended, I could always swap it out and use a smaller pot. I considered that the 1K pot should probably be put at its center value, or about 500 Ohms for each side, and I would then adjust the gain while outside a case. Once satisfied put it into a case. As it turned out, this value seems to work rather well. While it may be able to be improved a bit, I thought the overall quality and volume was fine during my tests. This may change as I have SSB QSOs and get reports from others. The image/schematic below comes from QST December 2018 Page 53 of Hints & Hacks, and is used with permission. The one change/addition which was needed was the 1 K-Ohm, R3, resistor. This resistor is needed to bias the electret mic element and, without it (as I discovered when I forgot to include it), the mic does not work at all. The original article was by Paul Dobosz, K8PD and, as mentioned above, was for a dynamic mic element. The recordings were made using the SDRPlay radio and receiving program. The radio was connected to a dummy load with a wire attached to the dummy load. The SDRPlay radio was also connected to a length of wire and placed close to the wire connected to the dummy load. Both lengths of wire were looped and the separation between the two loops of wire was about 12 inches.